Ben's Memorial Mile and Family Festival will be on Saturday, June 15! Registration is open! BMM is a family festival and running gala to raise money and awareness for mental health and suicide prevention. Scroll down for more information. 2018 PHOTOS COURTESY OF ANN SKY PHOTOGRAPHY! 2018 PHOTOS COURTESY OF AWP PHOTOGRAPHY! There will be race-day registration for $30 (adults + older kids) and $5 (little kids’ 100m dash). Take a look at this video from a previous Ben’s Memorial Mile! Looking for other ways you can donate? You can purchase Amazon goods through Amazon’s charitable website smile.amazon.com and select Ben’s Memorial Mile as your charity. A portion of your purchases will be donated to BMM. Yard Signs Will Be Available! We will have yard signs again this year! If you are interested in displaying one, email us at info@bensmemorialmile.com with your address, and we will drop one off! Jamie Silver (Ben’s mom) wrote a book about connecting with Ben. You can find Our Forever Ben: Letters from a Loving Mom to Her Son in Spirit, And His Poetic Replies via the link below. Benjamin Lee Silver was not only a son, brother, cousin, friend, teammate, captain, and fierce competitor—he was also a huge figure in his community: an enthusiastic and empathetic person who positively touched those around him. As a student at Downers Grove North High School, he was a four-time all-state athlete well known for his success on the track and cross-country course. Ben continued his athletic and academic pursuits at Miami University of Ohio, a top liberal-arts institution with a storied athletic history. However, during his college career he had a series of injuries and could not run, and his academics struggled as a result. He began acting erratically, and during the summer of his junior year he was diagnosed with schizophrenia, an often misunderstood and misdiagnosed disorder that typically arises in late adolescence and early adulthood. Though Ben’s struggles with this terrible illness eventually led to him taking his life in July 2015, the influence he had as a family member, friend, teammate, captain, and competitor lives on. Join us this year for the third-annual running of Ben’s Memorial Mile, a community running event and celebration of life. Regardless of your ability, there will be an event for you! 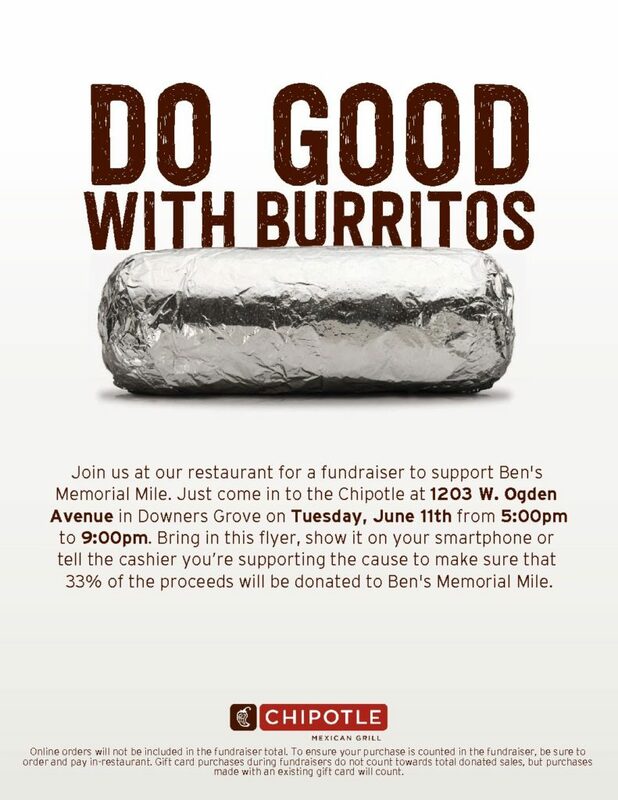 Join us in celebrating Ben’s life, your life, and all lives, all while raising awareness for mental health issues in the United States. It doesn’t matter whether you’re a former all-stater searching for a new personal best or a couch potato—there will be an event for you. Join us! The Brain & Behavior Research Foundation is committed to alleviating the suffering caused by mental illness by awarding grants that will lead to advances and breakthroughs in scientific research. Hope For The Day (HFTD) focuses on suicide prevention and mental health education through self expression platforms to achieve outreach, education, and prevention. It’s ok not to be ok, have hope. NAMI, the National Alliance on Mental Illness, is the nation’s largest grassroots mental health organization dedicated to building better lives for the millions of Americans affected by mental illness. Can't make it to an event? Here are two ways you can help! Donate today or volunteer your time!